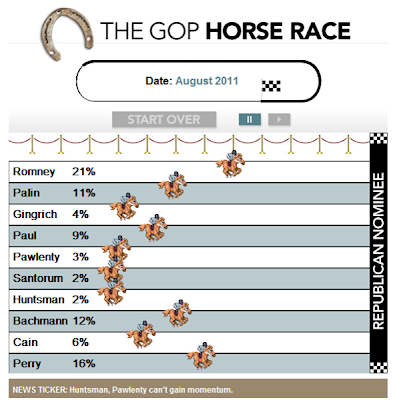 Who's Ahead for the GOP Nomination? Playing the animation shows the horse race from March 2010 to date. A news ticker displays contemporaneous events. While the concept is amusing, it is also informative: notice how each new entrant initially sprints away from the laggards up near to the leaders, but then falls back. These nags may look appealing at first, but they can't keep it up. The treatment is very accurate, but light on some of the details. All horses are accurately shown being ridden by jockeys; however, the jockey's colors (Koch Industries, Bank of America, etc.) are tastefully omitted. Even more generously, all candidates are represented by entire horses; some would be more accurately depicted by just the back end.